A clever experiment reveals how highway noise drives songbirds out of forests and harms the ones that stay behind. In the autumns of 2012 and 2013, any hikers walking along a particular ridge in Idaho’s Lucky Peak would have become very confused. One minute they’d be enjoying the tranquil chirps and rustles of a temperate woodland. The next, they’d be immersed in the unnervingly realistic sounds of a roadway: metal rushing past at speed, tires rolling over asphalt, honking horns. The nearest road, however, was several miles away. 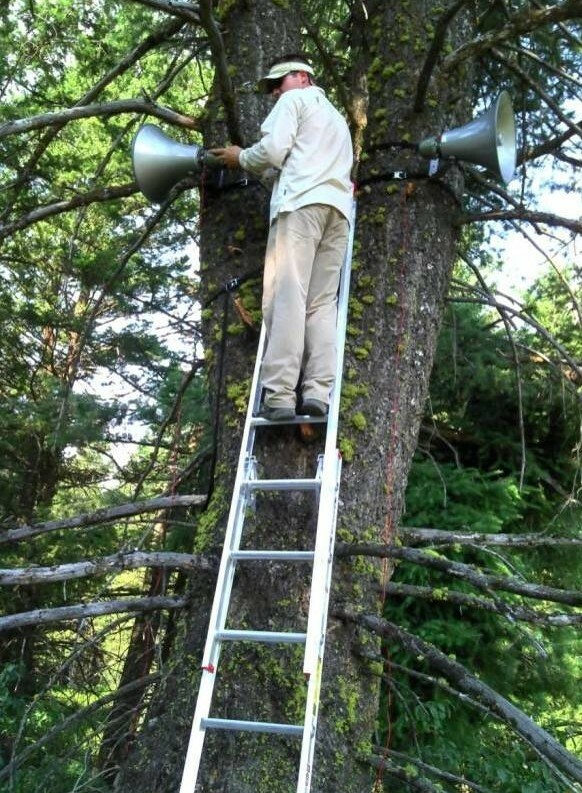 These noises were coming from 15 pairs of large bullhorn speakers that had been lashed to the trees. The hikers were walking along a phantom road. This half-mile corridor of disembodied sound, this road in noise only, was the work of Jesse Barber and a team of scientists and volunteers from Boise State University. Their goal was to answer a simple question: How does the bustle of traffic affect the presence and health of birds? Others studies have found that noisy man-made structures, from roads to natural-gas plants, can drive away wildlife and drown out their calls. But in all of these studies, noise was accompanied by other problems—pollution, the potential for collisions, and predators patrolling the roadsides. “No one had done the obvious thing: use speakers to simulate the noise component of a road and create a phantom road,” Barber said. To do that, his team, including masters student Heidi Ware and postdoctoral researcher Christopher McClure, recorded the sound of a dozen cars zooming through Glacier National Park. They combined these recordings into a looping, minute-long clip, which represented the kind of traffic you’d get in some of North America’s most-visited national parks. They then unleashed this clip on a ridge in Lucky Peak State Park, where forests of mighty Douglas firs give way to lush bushes of chokecherries and bitter cherries. It took months of hiking and hard labor to set the speakers up correctly. “I got really good at carrying lots of heavy batteries,” says Ware. Once everything was in place, the team turned the road on and off for four-day stretches throughout the autumn months, just as migrating songbirds were flocking to the ridge. During this time, they hung large nets between the trees to capture the passing birds, and to count their numbers and analyze their health. The team also compared the birds at the phantom road to those at the neighboring Intermountain Bird Observatory, a site just a kilometer away, where migratory birds have been monitored for more than 20 years. They found the phantom road drove a third of the local birds away from the ridge. And those that stayed didn’t have it easy. At least five species, including MacGillivray’s warblers, western tanagers, and Cassin’s finches, were substantially lighter for their size if they arrived when the road was in effect compared with their counterparts who arrived when the road noise was turned off. That’s a problem. The area where the team summoned their phantom road is a critical staging ground for migrating songbirds. They stop there for just under a week, gorging on the blankets of berries to prepare themselves for the arduous journey ahead. Beyond the ridge, they must fly south over the Snake River Plain, which has little food, few trees to hide within, and one of the highest densities of birds of prey in North America. Imagine, then, a flock of weak and ill-prepared songbirds, running this gauntlet of arid climate and hooked talons. Same bird, more noise, totally different behavior. Why were the birds failing to pack on the pounds, despite the rich glut of berries around them? Barber’s team unpicked one possible reason through laboratory experiments. They played road noises to captive white-crowned sparrows and saw that the birds spent less time looking for food with their heads down, and more time scanning for danger with their heads up. Traffic noise, by drowning out the sounds of impending threats or alarm calls, forces birds to look for danger instead. This distracts them from the business of finding food, and leaves them physically weaker. Just look at the sparrow in these two clips. First, surrounded only by ambient noise, it bounds over the ground, searching for morsels with a carefree air. Later, bombarded by a phantom road, it stays rooted to the spot, and seems wary and tentative. Same bird, more noise, totally different behavior. Barber agrees. He is also testing ways of minimizing the effects of noisy roads, including lowering the speed limits, erecting noise-cancelling walls, or using quiet pavements whose textures and materials are designed to produce less noise. Over four years, he will test these measures to see if reducing road noise in national parks benefits both human visitors and local wildlife. Barber is also expanding his research beyond songbirds. He is now setting up a phantom natural-gas field, where huge stadium speakers broadcast the ruckus of gas compressors. “We’re trying to see if birds and bats are pushed out by noise,” he says, “how that impacts the insects, and how that cascades down to plants.” How, in other words, does a force we cannot see affect organisms that cannot hear?